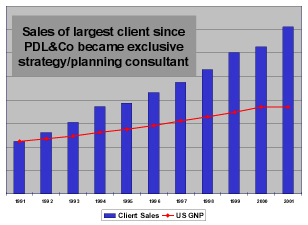 Established in 1986, P. D. Lovett & Company is a management consultancy focused on business planning, market analysis, new market evaluations, and acquisition assessment. The company's primary customer base is industrial manufacturing entities with sales from $5 million to $200 million. PDL&Co; bases its conclusions on detailed analysis that includes computer-based manipulation of data, library, internet, and other reference materials, and telephonic research techniques. Projects typically include a series of presentations that progressively refine company, market, and competitive research. Our goal is to allow our clients to take advantage of seasoned experience in analytical market research and business development while avoiding the burden of an added "marketing" executive.